This conservation resource was created by Javier Puac, JiaYi Song, Anna Madsen and, Peiyue Yan. It is shared under a CC-BY 4.0 International License. Often called the unicorn of the desert, the majestic Arabian Oryx ranged the interior of the Arabian peninsula for thousands of years before over-hunting in the 20th century lead to its decline and ultimate eradication in the wild by 1972 . Fortunately, a decade prior to their extinction, conservationists had the foresight to start “Operation Oryx” which oversaw the establishment of a captive breeding herd that would bring the species back from the brink . The Arabian oryx is a flagship species of the Arabian peninsula, and has since been reintroduced to its native habitat both in protected reservations and in the wild under “ the restoration programme” . As the population of Arabian oryx has been somewhat recovered, it represents one of the great wildlife conservation success stories of our time. However, short term success is not the same as long term solutions. The species still faces many threats and the years after reintroduction saw many fluctuations in population numbers and health. The journey to permanently reestablishing the Arabian Oryx still has a long ways to go, but the revolutionary methods of conservation used thus far have changed the game in the Oryx's favor and served as a model for reintroduction projects all over the world. The Arabian Oryx (Oryx leucoryx) is the national animal of Jordan, Qatar, and UAE. It belongs to the family Bovidae and subfamily Hippotraginae, and it is the only one species that can be found outside from Africa of the three Oryx species . Among these four species, there were two species that went extinct in the wild, Oryx leucoryx and Oryx dammah. 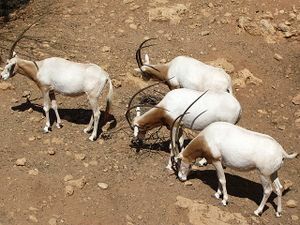 Even though the Arabian Oryx went extinct in the wild during the 1970s, the free-ranging populations have been established in Israel, Oman, and Saudi Arabia since then . For most Arabian Oryx, their average lifespan is around 21 years, which is higher than some of the other Oryx species. Historically the Oryx was found in herds of up to 30 individuals, but today groups in the wild are much smaller with as few as five individuals. These herds are usually made up of a single adult male, and few females who are young. "Bachelor" males tend to live alone . The reproduction timing of Arabian Oryx varies depending on the environmental condition. On average, a female Oryx can reproduce one offspring per year during any month if the climate condition is suitable for them. For example, the Arabian Oryx in Oman and Jordan reproduce their offspring during October to May, which is a long period in a year. The average gestation period for the Oryx is around eight months, and this period also varies on climatic factors. Arabian Oryx has an average body length of 160 cm/5'3 feet and an average weight of 65 to 70 kilograms. The coat colour of the body of Arabian Oryx is white, but they usually have a mix of white and dark spot coat on their faces running from their nose to the centre of their faces. Large, splayed hooves help the Arabian Oryx keep their footing on the sandy dunes . Their tail is fringed and has a colour of dark brown to black, and they grow horns around 60 cm for both female and male Oryx, the only difference being that the female's horns are usually slightly thinner. However, some populations have a yellowish coat colour and the intensity of their dark spot also varies on the seasons and climate . According to research, only adult Oryx's will experience a variation in their coat color depending on the change in seasons and climate. Calves are born a light tan and usually begin to show their adult markings by the time they are six months old. Most populations of Arabian Oryx inhabit the arid plains and deserts of Arabia, where the warmest temperature in summer can be up to 50 degrees Celsius, which means that they are very tolerant to hot, arid conditions . An Oryx's body temperature can rise to 45 degrees Celsius during hot days without sustaining any permanent tissue damage, and they can survive for months without drinking, getting all of their water from the grasses and tubers they eat . The Arabian Oryx is also abundant in mountain regions, such as hilltops and thick brush, where the elevation may be higher than the desert, and they walk on bare rock instead of sand. The terrestrial ecosystems where Arabian Oryx's inhabit, are abundant in biodiversity, many species of trees and under story plants may grow in these environments. The Arabian Oryx was traditionally spread all over the inner Arabian Peninsula, stretching to countries as far north as Israel, Jordan, Kuwait, Iraq, Syria, and Sinai where they occupied deserts and mountain ranges. However, the 20th century saw their range begin to decline. By 1920 the Arabian Oryx had been isolated to two regions, the larger Rub' al Khali which saddled the border of Saudi Arabia, Yemen, and Oman, and the Nafud population in northern Saudi Arabia which would be completely eradicated by the 1950s . Barely a decade later the only place in the world that the Arabian Oryx could be found in the wild was the interior of Oman, and they too disappeared when the last herd of six was killed or captured on October 18th, 1972. The Arabian Oryx remained completely extinct in the wild until 1980 when conservationists returned the first herd back to its native habitat. The traditional bedu tribes of the Arabian Peninsula have hunted the Arabian Oryx for their use as food, clothing, and even medicine since ancient times, however the 19th century brought new technology to the middle east which made hunting easier than ever . Even more threatening than the introduction of the guns was the advent of the automobile which made the Oryx's seemingly barren desert habitat accessible to westerners . Built by oil companies, roads soon became highways for motorized hunting brigades. While an Oryx could out run a traditional hunter with a rifle, they stood no chance against a well supplied motor party, especially if was led by one of the local Harasis guides. It's estimated that half of Rub' al Khali's remaining Arabian Oryx population was killed in a single hunting trip in 1961. Another not insubstantial threat to the Arabian Oryx was the demand to catch them alive. In order to catch just a single Oryx, the entire herd would be chased to the point of exhaustion until one of them slowed enough to be brought down with a net. This often resulted in the death of the animal captured, as well as the eventual death of a few of its worn out herd mates . While some of the attempted captures were executed by those who wished to sell the Arabian Oryx to private menageries, a substantial number were funded by conservationists who would sometimes end up killing the animals they were trying to save. One such extraction effort by conservationists was carried out by The Fauna Preservation Society in 1962. The expedition was deemed "Operation Oryx and resulted in the capture of one female, and three males, one of whom died from the exhaustion of the chase. After some disagreement, it was decided that the remaining three Arabian Oryx were to be moved to the Phoenix Zoo in Arizona as the climate most closely matched their native habitat. Under the collective management of the Arizona Zoological Society, the Zoological Society of London, the Shikar-Safari Club, and the World Wildlife Fund, six more Oryx were gathered from the private collections of HH Shaik Jaber, HM King Saud, and the London zoo . These nine individuals were the first members of the World Herd breeding program; their successful breeding led to the birth of several calves which were then traded with the Los Angeles Zoo, Gladys Zoo, and San Diego Wild Animal Park for the purpose of maintaining genetic diversity. By the time the Arabian Oryx went extinct in the wild in 1972, the World Herd consisted of 45 individuals and by the time it was officially disbanded in 1979, there were 137 . Operation Oryx and the creation of the World Herd breeding program proved that the captive breeding of Arabian Oryx was incredibly successful, the next challenge however, was seeing if they could be reintroduced to their native habitat. Various programs have been initiated around the world to bring the population of the Arabian oryx back to healthy numbers. When it came time to reintroduce the Arabian Oryx to the wild, Oman was the first country to take initiative in reestablishing the species. With the help of R. H. Daly, Oman's adviser for conservation, and Dr. H. Jungius of the WWF, it was decided that it would be best to release them in the same region where the species was last recorded being seen before their eradication, the Jiddat-al-Harasis in Oman. The region was deemed to have sufficient vegetation to support several herds, and in preparation of their arrival a large pen was constructed to give the animals a chance to acclimate to their surroundings. From 1980 to 1983, the San Diego Wild Animal Park sent 17 Arabian Oryx from the World Herd to Oman. The first herd of ten Oryx was officially released from their acclimation pen into the wild in January of 1982. In anticipation of the Oryx's release several legislative measures were taken including a total ban on hunting with vehicles, a law prohibiting the capture or harm of large mammals, and the appointment of a Royal Oman Police made up of local Harasis men who would protect and document the movements of the Oryx and gazelle living in Jiddat-al-Harasis . Several agreements were made with the local Harasis bedu people that although the Jiddat-al-Harasis continued to be their land, they would establish a safe grazing area for the newly introduced herds and keep settlements at least 5 km from areas where the Oryx frequented . Benefits for the Harasis included the return of a symbolically important species and many long term work opportunities as rangers and general staff for the oryx project which would not have been successful without their enthusiastic support. Although the first decade of the program saw marked success with over 400 individual Oryx roaming free in the wild, the end of the century brought tragedy to the program. Poachers began targeting first calves and then grown females to capture for the exotic animal trade, leaving the entire population devastated. By September 1998 there were only 138 Arabian Oryx left in the wild. Rather than risk the loss of their entire breeding population to poachers, it was decided that the majority of the remaining females should be recaptured . By 2007 only 60 individuals were left in the wild of Oman, all male with the females being held in pens for breeding purposes. A further blow to the program came on June 28, 2007, when Oman's Arabian Oryx Sanctuary was the first site ever to be removed from the UNESCO World Heritage List because of the construction of oil pipes, which was accompanied by the reduction of the sanctuary from 34,000km2 to 2,824km2 . However, luckily for the Oryx, the captive breeding population in Oman remains sizable, and it is far from the only program of its kind being undertaken in the Middle East. 1989 saw Saudi Arabia start a conservation and restoration programme for oryx which was initiated by the National Wildlife Research Center (NWRC) under the Saudi Wildlife Commission (SWC). The restoration program was initiated when 57 individuals were transferred from the King Khalid farm to the NWRC Some goals for the program were to re-establish self-sustaining and wild populations of Arabian Oryx in Saudi Arabia, to develop breeding techniques in semi-captivity allowing the making of healthy oryx herds, and to improve their genetic variability. The founder population which was called the ‘A’ generation, was kept in isolation and bred in individual pens to avoid risk of disease transmission. The ‘B’ generation consisted of oryx’s which had been taken care of through human contact, which eventually became the main herd for production suitable for reintroduction. A ‘C’ generation was mother-reared in large enclosures and transferred to the reintroduction site when 9-15 months of age was reached. In present day a ‘D’ generation exists which is a mix of ‘B’ and ‘C’ generations. All these different generations saw the NWRC herd become the most genetically diverse in the world. Two sites were chosen for re-introduction of Arabian oryx in Saudi Arabia and they were the Mahazat as-Sayd, and the Uruq bani Ma’arid Protected Areas. The first releases took place in the Mahazat as-Sayd Protected Area, an area completely fenced in 1989 to prevent access to poachers, and to livestock. A total of 82 oryx’s have been released since 1990-2009, 44 individuals came from the NWRC captive breeding unit, and 38 from other private collections . Large die-offs of the Arabian Oryx were recorded from 1999-2009. Deaths were due to starvation because of reduced availability, accessibility and quality of food plants in the area due to insufficient rainfall. A total of 560 oryx deaths were recorded since the reintroduction project began till 2009 here in this site. The fence around the site prevents wide ranging natural movements of the animals, artificially concentrating the population in unfavorable habitat at various times during the year The second release site was the Uruq Bani Ma'arid Protected Area, this reintroduction site is unfenced, and releases began in 1995. Since 1995, 174 oryx were translocated to this site and no transport related deaths occurred. A total of 146 oryx originated from the NWRC captive breeding facility while 28 came from the Mahazat as-Sayd Protected Area . Monitoring the achievements of the re-introduction measures, the captive-breeding program at NWRC has achieved its goals. The captive herd at NWRC is maintained for other re-introduction programs in protected areas around the world. The establishment of a free-ranging population in the Uruq Bani Ma’arid Protected Area is also considered a success as of 2009. The Arabian Oryx would not be extinct today if it were not for massive and effective conservation efforts, via captive breeding and reintroduction. Currently, the number of populations in Oman have declined, but there are now wild populations spreading in Saudi Arabia along with Israel. Additionally, a large, fenced reserve in Saudi Arabia, is highly populated which covers more than 2000 km2. One of the largest populations is found in Mahazat as-Sayd Protected Area. In general, the reintroduction of the Arabian Oryx to Oman helps maintain the local adaptation of populations in the desert region. In addition, this measurement enables the prevention of inbreeding and inbreeding depression within a small population by genetic modification, and by selection under artificial intervention. Based on the study of genetic diversity, the Arabian Oryx provides a good example of managed species through restoration decision and enhanced through genetic rescue (translocation).A way in which introducing individuals from another population into a different habitat leads to an increase in genetic diversity, and decreases inbreeding. Consequently, the Arabian Oryx could better adapt to climate change in the future and the risk of extinction would therefore be reduced. The restoration of the Arabian Oryx is a story filled with sadness, great will and hope. Hunter’s went to extreme measures to catch these beautiful creatures. Efforts included chasing the entire herd to absolute exhaustion, until one or a few gave in from exhaustion. Conservationists began to open people’s eyes and make them come to the realization this species was near extinction and, it was all thanks to themselves. Conservation efforts were initiated with Oman the first to blossom, followed by Jordan and Saudi Arabia. These restoration efforts have stabilized the Arabian Oryx population, but more work must still be done. Endeavors were reward for these initiation efforts when the IUCN changed the status of these creatures from Endangered to Vulnerable, a huge step in the right direction. Let the story of the Arabian Oryx be a foundation and a lesson to future conservation efforts. Where anything can be achieved, but not without the efforts of those who originally put them in this cruel situation; the human population. Since poaching of the Arabian Oryx still remians a challenge to the population in the Middle East, we suggest the local government refer to collaborative management practices and, work with local communities and authorities. Through an effective collaboration, a guarantee of protection of the species would be emphasized, and most importantly, the concept and the practice of conservation will be widely recognized in the long run. ↑ 2.002.012.022.032.042.052.062.072.082.092.102.112.122.132.142.15 Price, M. R. (2010). Animal re-introductions: the Arabian oryx in Oman. Cambridge: Cambridge University Press. ↑ 10.010.110.2 Islam Zafar-Ul, M., Ismail, K., Boug, A. (2011). Restoration of the Endangered Arabian Oryx Oryx Leucoryx, Pallas 1766 in Saudi Arabia Lessons Learnt from the Twenty Years of Re-Introduction in Arid Fenced and Unfenced Protected Areas. Biodiversity Conservation in the Arabian Peninsula Zoology in the Middle East, 125–140.